I am realizing that I better get going with some Christmas cards .... I'm not typically a mass producer with my cards I send at Christmas....so it's one at a time for me, and time is ticking! I just got an order of SU in last night and it was fun to look at my new sets and pull this one out today for the SCS Sketch Challenge. I took this in bright (probably too bright) sunlight....but you can really see the white pop :)! It's called Merry Crittermas from SU and I've colored it with copics. Aren't these little raccoons cute? I used paper from last years Christmas line Ski Slope, as well as the felt snow flurries from last year and this years new snowflake embossing folder (really pretty!). What I hope you can see above is the touches of glitter I added with my Spica pens over top of the copic coloring it adds a nice touch of subtle sparkle. And by shadowing with BG0000 around the Critters, tree and snow it gives the feeling of them being grounded, and standing on the snow on the ground. So what about you? When do you start your Christmas cards, and how many do you make? This is just too cute!! I wasn't going to order this set, but now I totally want it! Thanks alot. LOL. Wonderful job of the coloring, as usual. Really, really wonderful job with this card! I love all the elements and the coloring, the felt flakes! I am enamoured! 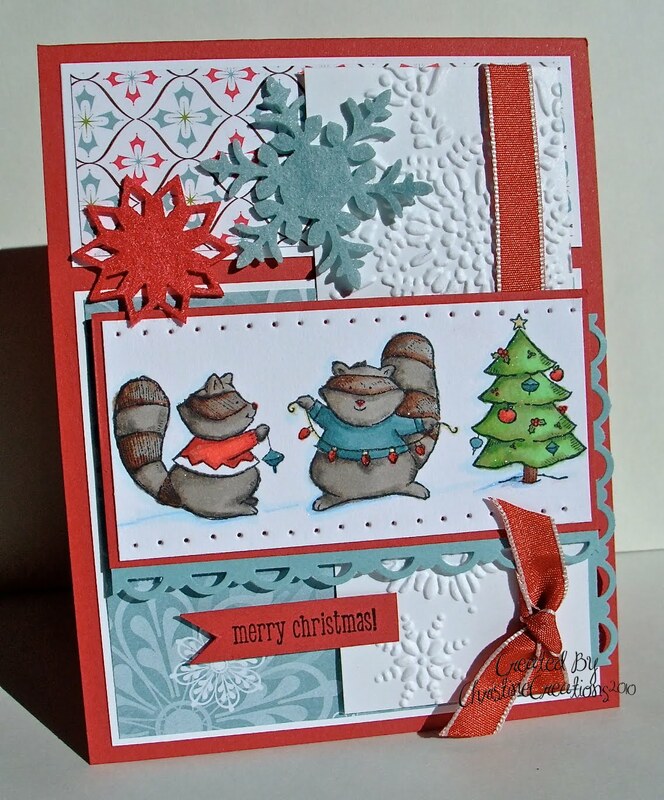 What a darling card, Christine :) Love the focal image and you've coloured it wonderfully. Lovely DPs and the white embossed panel is great. One down :) I do some mass producing of cards to those I mail to (mostly family and a few close friends) and have succumbed to e-mailing a Christmas letter to those who I have e-mails for as it gets too expensive to mail cards to everyone. SO cute, Christine! Those critters are adorable! I love all the snowflakes and the bits of sparkle too! OH! I just might have to get that set!LOL!! sooo cute!! Great card Christine! ACK! This is SO cute Christine! 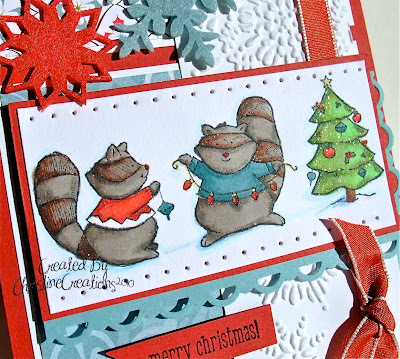 LOVE these little guys and your coloring is FAB! Too, too cute and fun Christine!! Love this darling card! Christine, I love this card ! The embossing looks great. I try to use only one set of Christmas stamps, to avoid confusion of "what did I send last year?" LOL But, I do make religious ones for special family members. Oh, and the yearly letter to everyone on my list. My goal is to get about 30 done before Thanksgiving. Thanks and have a great day! What a cute card! I love the raccoons and beautiful colors. The snowflake embossing adds a nice touch. beautiful raccoons christine, lovely card. Hee hee Oh so darn cute!